Cage Wars “May the 4th Be With You!” represents the debut of Youth (8-17) and Adult Novice MMA (no head strikes) in Wisconsin sanctioned by the United States Fight League (USFL) and presented in conjunction with the WI MMA Federation (WIMMAF). 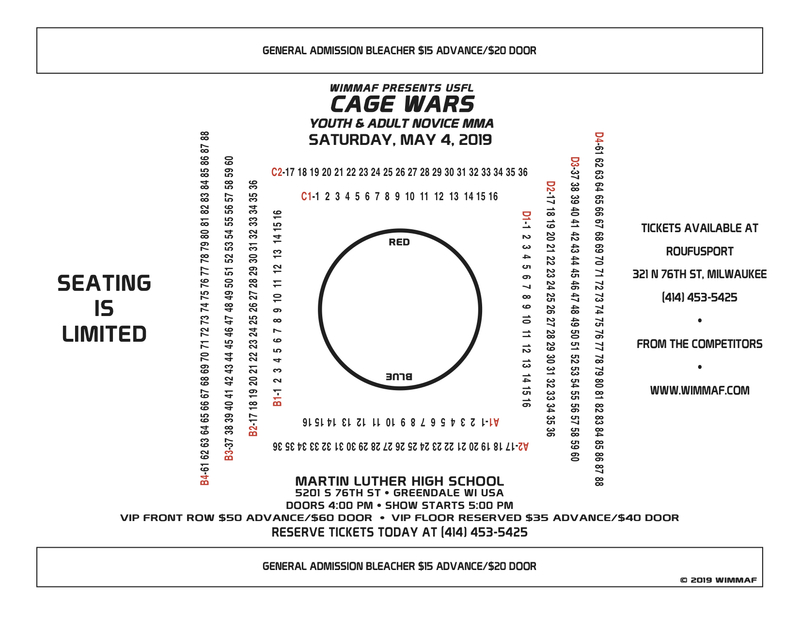 Cage Wars Youth and Adult Novice MMA will take place Saturday, May 4th at Martin Luther High School, 5201 South 76th Street, Greendale, WI, starting at 5:00 pm (doors 4:00 pm). Tickets can be reserved online now and will be available for pick-up at Will Call ONLY the day of the show starting at 4:00 pm (show starts 5:00 pm). Tickets will also be available at the door. VIP Reserved Seat tickets are pulled on Best Seats Available (first come, first served) basis at time of purchase. *PLEASE BRING PHOTO ID AND ORDER RECEIPT. NAME ON ID MUST MATCH NAME ON ORDER.